So she started to walk. A fourteen year old kid sat alone beneath the moonlit sky. New life stirred within her spirit. Hope. It was a word she hadn’t known for many months. All had seemed futile. But now, oh but now, everything was different! She saw. She understood. She wept with joy, clearly comprehending for the first time, the debt paid on her behalf. Peace. And in her heart she counted the cost. To this One, the Redeemer who died and rose again, to the One who set her free, she’d give anything. I remember that kid. Life immediately turned a radical 180. She grew like wildfire, with the unshakeable faith of fresh belief. She prayed and Heaven answered. God heard her. It was as simple as that. There was nothing He could not do. She began to walk, and the path was filled with wonder. Marveling at beauty she’d never seen before, her heart felt light and airy. Over time, however, the path began to twist, and she couldn’t see what lay ahead. “I will guide you with my eye upon you.” the Redeemer reassured. As she walked, she noticed thorns amid flowers and tangled vines beside and above. At times the sky grew dark, and rain soaked her through and through. She stumbled. Muddy and bruised, the way wasn’t always as pleasant as she’d imagined. All the way the Redeemer led her, keeping his eyes steadfastly upon her. And she returned his gaze. There were steep hills and deep rivers. There was wandering in the wilderness. She staggered, but the Redeemer gently pulled her to her feet. Sometimes she wanted to quit. Sometimes she looked around and thought that other paths seemed a little more fragrant. “The Lord is my chosen portion and my cup; you hold my lot…In your presence is fullness of joy.” She reminded herself often. And there were also flowers and many days of sunshine. She rested in green meadows. She drank from peaceful streams. Ocean breezes cooled her face. Breathtaking landscapes crept over the horizon. There were fireside chats. And music. And laughter. And night skies filled with a million stars. There was even beauty among the thorns. The path was a winding ribbon, taking her places she’d never expected. Sometimes it was hard, much harder than she’d initially guessed. But she was cared for, loved, free, clean, and known. It was completely worth it. One day, without warning, she walked right off a cliff. In terror she tumbled end over end, falling deeper than she ever had before. The chasm seemed to have no end. How she did not die when her form slammed to the ground, is a mystery of grace. She lay crumpled, broken, and devastated. Looking around, she knew the place. The path had led her to the valley of death. Sobbing. Pain. She couldn’t get up. Looking from the mountain above, others saw her sitting there, knees drawn tightly to her chest, head down, rivers of tears forming at her feet. Some offered platitudes from the safety of their own paths above and some couldn’t make the treacherous descent. But others climbed down the steep incline and sat there with her. They let their tears mingle with hers. The Redeemer knelt beside her, tenderly binding her wounds. Broken, she couldn’t leave the place for many weeks. And in the valley of death, she sat. The winds rose around her, a hurricane. The waters rose in that valley, threatening to drown her. There were days when she screamed and beat her fists on the ground. Yet more often than not, she sang. 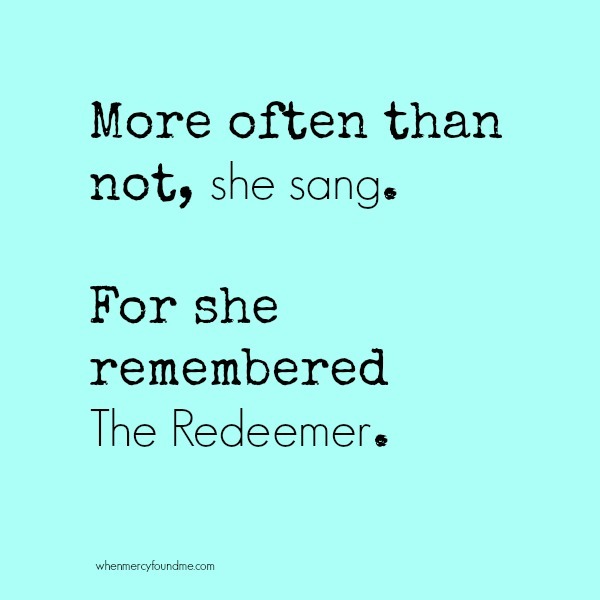 For she remembered the Redeemer. And he spoke precious words. And there in the valley she began to see things with new eyes. The stars. Oh how magnificent! Indescribable, infinite in majesty, they were more brilliant than she’d ever realized. She caught glimpses of the End. A word formed in her heart to describe that place. Eternity. She began to long for it. And the Redeemer, how she saw him! It was there he took on startling clarity. She’d known his power before, but now she experienced his suffering also. She understood how he had suffered for her. He was the goal. Eternity. It meant being with the Redeemer. Over time the broken bones healed. Color returned to her cheeks. She bore jagged scars, but she thought they were beautiful. She noticed flowers growing. She felt a gentle breeze. Eternity called her name. It was time to get up. She glanced at the incline leading out of the valley. It twisted and turned, and she couldn’t see where it went. She saw thorns on tangled vines. But she also glimpsed blue skies and rolling meadows ahead. Looking back, I know I left the valley a while ago. Praise God for beauty. Praise God, He is fullness of joy. Amen! Next > Stop Saying You’re Sorry. Thoughts on True Community. This is beautiful. Such a picture of the Christian journey. It is a path filled with unspeakable joy, crushing sorrow, and glorious grace… and through it all, our Redeemer is with us, and we can fully trust Him. Thank you Audra. That’s exactly the message I was hoping to portray! I’m glad it was a blessing and encouragement to you. Yes, praise God for matchless grace and fulness of joy found in Him! Thanks for taking time to leave a comment! Blessings to you today. Oh thank you Sonya! Your words mean much. I’m so glad it has blessed you. I’m thankful God is using Jon’s death in marvelous ways. Well done. Beautifully written from the heart! Thank you Amy! You encourage me also!